Air Canada plans to deploy the bulk of its 2016 capacity growth to international markets, after having cut some capacity in Western Canada during 2015. The airline is less exposed to that region than rival WestJet, which is headquartered in Western Canada and is projecting steep unit revenue declines in early 2016 due to weakness from lower demand in the oil and gas sector. Air Canada embarked on the year 2016 by placing a letter of intent to purchase 45 Bombardier CSeries jets. In parallel, the Quebec government (which now has a stake in the CSeries) dropped a lawsuit against the airline related to aircraft maintenance performed in the province. However, Air Canada contends that it faced no political pressure to place an order for the beleaguered CSeries. Air Canada’s order gives the Canadian manufacturer a dependable national customer now that Porter’s order remains in doubt, and the aircraft's other North American customer, Republic Airways Holdings, has entered bankruptcy protection. After trading at a discount for most of 2015 Air Canada has opted not to provide yield, unit revenue or capacity guidance on a quarterly or annual basis. The company’s rationale for the decision is a focus on its long-term strategy laid out to its investors in mid-2015, with specific ROIC, ratio and EBITAR margin targets. The company has emphatically stated that if short-term investors are not happy with the new policy, they are free to look elsewhere. Yields and unit revenues at Air Canada have been falling for a year, driven mainly by its strategy to focus on international growth, particularly long haul leisure markets that feature a higher mix of lower-yielding passengers. 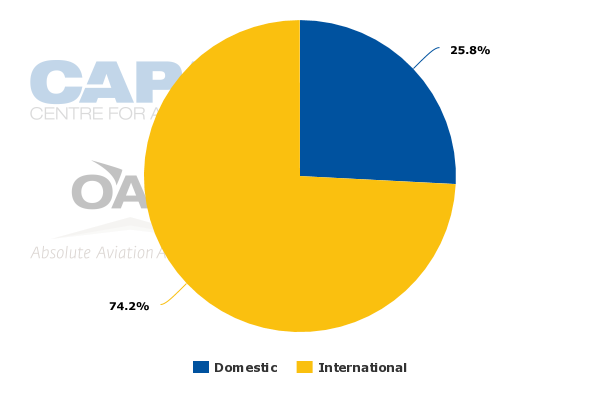 During 2015 the airline’s average stage length increased by 3.2%, and Air Canada has stated that its stage length for 2016 is projected to grow at similar levels. A higher proportion of leisure travellers driven by the expansion of its leisure airline subsidiary rouge, increased stage length and lower fuel surcharges helped drive Air Canada’s 2015 passenger unit revenue down 4.4% as yields fell 4.6%. Air Canada cited some pricing pressure in Western Canada, particularly in the province of Alberta in 4Q2015, that is continuing into 1Q2016. WestJet, which is headquartered in Calgary, Alberta, is forecasting a unit revenue decline of 7% to 8% in 1Q2016, driven mostly from weakness in Western Canada. Calgary is WestJet’s largest base for the week of 22-Feb-2016 to 28-Feb-2016, based on seat deployment. Air Canada maintains that it is immunised against the weakness faced by WestJet, stressing that two thirds of its CAD13.9 billion (USD9 billion) in passenger revenue recorded for 2015 was driven by its international markets. The airline stated that it had moved capacity out of Alberta in 2015, but explained that it was not piling on the capacity pulled from the region into other markets to depress margins on those routes. Company CEO, Calin Rovinescu, highlighted numerous international markets introduced by Air Canada in 2015, including Vancouver-Osaka, Montreal-Venice, Toronto-Amsterdam, Montreal-Mexico City, and Toronto to Delhi and Dubai. At present, (22-Feb-2016 to 28-Feb-2016), 74% of Air Canada’s ASM are deployed onto international routes. Mr Rovincescu declared that Air Canada had executed its international expansion in 2015 profitably. Although Air Canada has decided not to offer annual capacity guidance, the airline has previously stated that 2015’s growth of approximately 9.4% could be a benchmark for 2016’s expansion. The company expects that 90% of its capacity expansion in 2016 will be directed toward international markets. It has announced a raft of new markets operated by rouge in 2016, including seasonal flights from Montreal to Casablanca and Lyon, and from Vancouver to Dublin. New seasonal services from Toronto include Prague, Budapest, Warsaw and London Gatwick. Air Canada will compete directly with rival WestJet on the Toronto-London Gatwick service, marking the first time the two airlines will compete directly on trans-Atlantic flights. Other long haul routes that Air Canada is introducing in 2016 include Toronto-Seoul and Vancouver-Brisbane. Domestically, Air Canada’s capacity additions in 2016 will be limited to meet local market growth and feed its international network. The company’s executives stated that the rest of domestic Canada was somewhat competitive, but that is not abnormal. Similarly to rival WestJet Air Canada is citing the flexibility that it has with its fleet, should conditions in its domestic or international network worsen. By mid-2016 Air Canada will have 23 aircraft in its fleet (widebody and narrowbody) that it will own outright. The company estimates that represents 3% to 5% of capacity that “we could sit for no cost”, said Air Canada CFO Michael Rousseau. The airline also has 18 leases up for renewal in the next year and a half. “We are in a much better position with 40 of our planes to reduce capacity in the short-term,” Mr Rousseau concluded. As of 24-Feb-2016 Air Canada has 160 mainline aircraft. rouge operates a fleet of 20 Airbus A319s, four A321s and 25 Boeing 767-300ERs. Orders include those placed directly by the operator and by lessors assigned to the operator, from 24-Feb-2016 onwards. In Feb-2016 Air Canada opted to give fellow Canadian company Bombardier a shot in the arm for its troubled CSeries programme by committing to order 45 firm CS300s, with options for 30 additional aircraft. The letter of intent coincided with the government of Quebec dismissing a lawsuit against Air Canada claiming that the airline had violated a regulation that required it to keep heavy maintenance in Quebec, Ontario and Manitoba. The litigation stemmed from the 2012 closure of Aveos, which performed heavy maintenance for the airline. As part of the settlement, Air Canada agreed to conduct heavy maintenance of the CSeries in Quebec. Prior to the dropping of the litigation, in Oct-2015 Quebec had outlined plans to invest USD1 billion into the CSeries programme. Although it seems as if Air Canada could have been nudged by the Quebec government to place a CSeries order, publicly the airline is declaring that it felt no pressure to purchase the aircraft. Air Canada’s commitment to the CSeries occurred after the release of Bombardier’s earnings, in which the conditional order for up to 30 CSeries jets from Porter was omitted. It has never been clear whether Bombardier received nonrefundable deposits due from Porter in Aug-2014. In late 2015 Porter lost a campaign to operate the narrowbody aircraft from the Toronto Island Billy Bishop airport. Perhaps with the likely discounting it received on the aircraft, Air Canada now has a new perspective on the CSeries. “Obviously, we had to get the right deal for it to make sense for Air Canada, and we did,” said Air Canada President, Passenger Airlines, Ben Smith. Mr Rovincescu stated that the first 25 CSeries narrwobodies are replacing Embraer 190s exiting Air Canada’s mainline fleet, and the Bombardier jets offer a 10% unit cost reduction over the aircraft they are pegged to replace. The Bombardier narrowbody jets join an order that Air Canada placed for 61 Boeing 737 Max jets in late 2013, in which Boeing agreed to purchase 25 of 40 Embraer 190s in Air Canada’s mainline fleet. As of 27-Feb-2016 Air Canada had 31 Embraer 190s in its mainline operating fleet. Boeing Max deliveries start in 2017, followed by the first Cseries deliveries in 2019. With deliveries three years away, Air Canada is not offering much insight into how the CSeries will function in its network. Mr Rovinescu stated that the Boeing 737-8/9 Max narrowbodies that the airline has on order perform better at the high end of the narrowbody size range. The -8 can be equipped with 200 seats in a single class configuration, and 162 in a two class layout. The -9 features 220 seats in a single class configuration and 180 with two classes. The Max aircraft on order by Air Canada are replacing the Airbus narrowbodies in the company’s fleet, which all feature a two class layout. Its 16 A319s feature 120 seats, the 37 A320s are operated with 146 seats, and the company’s 15 A321s are configured with 183 seats. The 135-seat CSeries is much more compelling at the lower end of the size range, Mr Rovinescu concluded. Air Canada’s Embraer 190s are configured with 97 seats, which is 38 fewer than the CSeries. Once the CSeries is introduced, Air Canada’s total fleet (including regional operators) will range from 19-seat turboprops to its high density 458-seat 777-ERs. Citing Canada’s size, and how it is positioned in the middle of a mix of traffic flows in the North American market, Mr Smith stated that the Boeing 737 Max, Air Canada’s 787s and the CSeries would allow the airline to offer numerous unique city pair combinations. The timing of other events surrounding Air Canada’s decision to order the CSeries is perhaps curious. But the order does give the manufacturer a key North American customer just as its client Republic Airways Holdings, which has 40 CSeries on order, filed Chapter 11 bankruptcy in late Feb-2016. With orders from Porter and Republic in doubt, Air Canada’s pledge to order the CSeries offers the programme some stability. Given the settlement that Air Canada has reached with the government, it has no room to back out of its CSeries deal. During the last year Air Canada has repeatedly had to explain that falling yields and unit revenues are byproducts of its long term strategy, as its stage length has been growing 3% to 4% annually during the last couple of years and its mix of leisure passengers has increased. In late 2015 Air Canada stated that it had been a challenge to communicate the drivers of unit revenue declines to the market place. During 2015 Air Canada’s stock price traded far below its North American peers – American, Delta and United. Its stock hit a high of CAD14.50 per share in Jun-2015, but in late Feb-2016 it had fallen to CAD7.24 per share. The airline is obviously frustrated with what it considers to be an undervaluation and perhaps short-sightedness by some investors over its long term strategy. As a result, Air Canada has decided to forego forward-looking quarterly and annual unit revenue and capacity guidance. “We believe such information and guidance without the context of full quarterly review of other key financial metrics risks distorting the proper understanding of our progress against our key financial targets and long range plan,” said Mr Rousseau. From now on, Air Canada will report its progress on achieving an EBITAR margin of 15% to 18% between 2015 and 2018, and an ROIC of 13% to 16% for that time period, and on posting a leverage ratio of 2.2x or less by 2018. In 2015 Air Canada delivered on those targets, posting an EBITAR margin of 18.3% and achieving an ROIC of 18.3%. Its leverage (net debt to EBITAR) for the 12M ending Dec-2015 was 2.5x. "Frankly, a 15% to 18% EBITAR margin should support a much higher valuation for Air Canada," Mr Rousseau concluded. Air Canada’s decision not to offer guidance on some key metrics is interesting in the light of stock valuations of large North American airlines falling below levels that executives of those companies think are appropriate. Mr Rovinescu has drawn a line in the sand with short term investors, stating that his management team is not running the airline for the benefit of that type of investor. He stated that if short term investors are not happy with Air Canada’s decision to stop offering certain types of guidance, “I encourage them to leave”. After stressing to investors to focus on more long term targets during the last couple of years, Air Canada has boldly decided to take steps to steer investors toward what it deems as better points of focus – margins, ROIC and debt reduction. It is a message most North America airlines are attempting to communicate to investors as lower fuel prices have created some softness in fares. It is too early to determine whether Air Canada will be successful in its efforts to push investors to shift their focus away from yields, unit revenue and capacity, but its decision not to offer guidance for those metrics is the most definitive move yet by an airline to nudge investors to think differently.